I walked around Montrose on Saturday morning, February 8 for a little while. 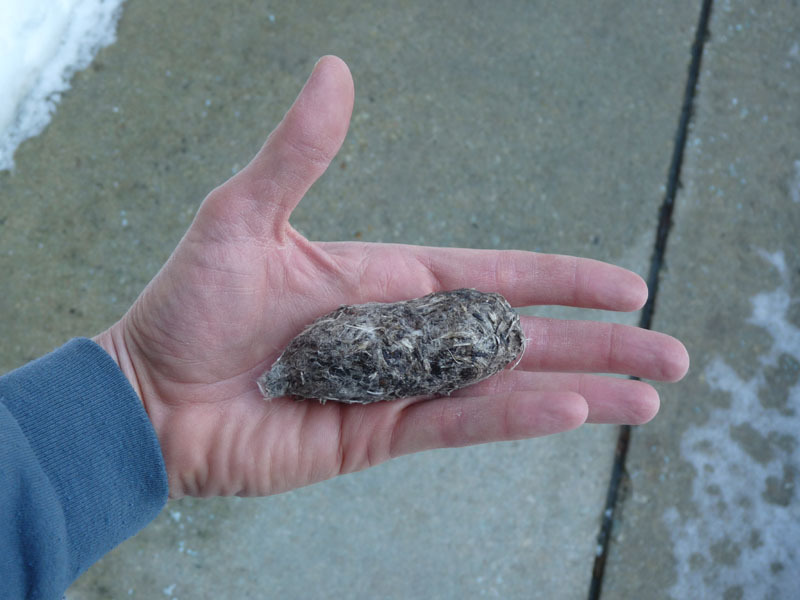 I didn’t see anything unexpected but I did find a putative Snowy Owl pellet on the revetment just south of the beach. It’s about 3.5 inches long and 1.5 inches wide and looks like the remains of a small mammal, perhaps a rat. I’m assuming it’s from a Snowy Owl based on the size of the bolus, the location, and the fact that so many Snowy Owls have been around. The specimen will be donated to the Field Museum. Followup: Field Museum biologist Josh Engel determined that the remains are from a scaup. This entry was posted in Winter Bird Reports and tagged Owls, Snowy Owl on February 9, 2014 by rhughes. Karen and I walked around Montrose for a little while this morning. The lake was covered in ice for as far as we could see but there were a few open areas of water, and these open areas of water had birds. Our biggest surprise was a juvenile Red-throated Loon off the end of the fishing pier. We actually heard the bird calling when we were walking on the beach but we didn’t know what it was. We thought it might be a person yelling for help since it sounded like a cry or a wail. When we got to the edge of the beach we could see the loon on the water and see and hear it calling. Mystery solved, and I don’t know if I’ve ever heard a Red-throated Loon call before. Unfortunately the bird flew off to the south before I could get my camera on it. There were also a lot of waterfowl here, including 40+ White-winged Scoters, a female type Long-tailed Duck, 5 Greater Scaup, Common and Red-breasted Mergansers, and Common Goldeneye. The other area of open water was at the harbor mouth. We had 15 more White-winged Scoters here, as well as 35 or so Greater Scaup and a few Common Goldeneye and Red-breasted Mergansers (see the photo above). Not a bad start to February. 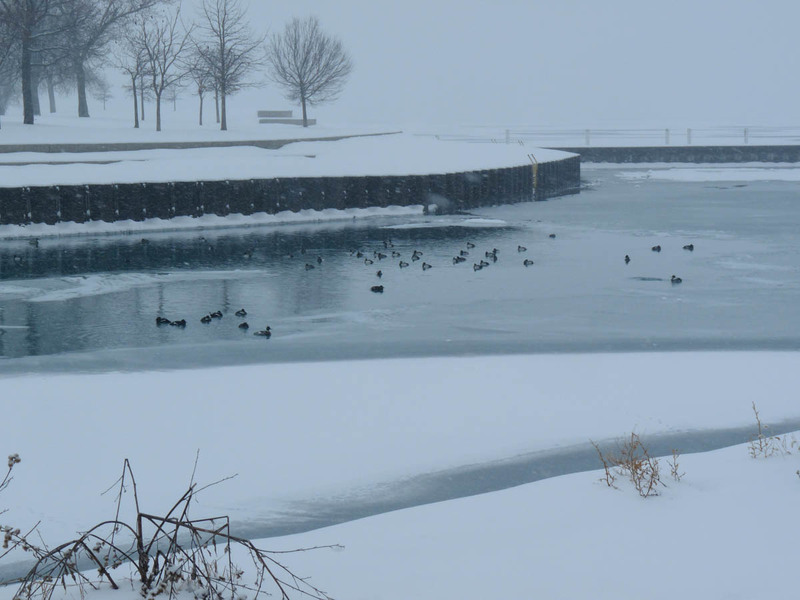 This entry was posted in Winter Bird Reports and tagged Long-tailed Duck, Loons, Red-throated Loon, Waterfowl, White-winged Scoter on February 1, 2014 by rhughes.